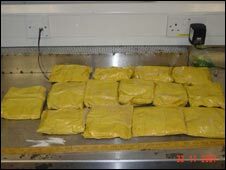 Two men who ran colleges for foreign students have been jailed for 16 years at Bradford Crown Court for smuggling heroin into the UK in the post. A third man was given 10 years for money laundering but acquitted of smuggling. Another was cleared altogether. All had pleaded not guilty. Yorkshire College, based in Bradford and Manchester, attracted hundreds of students, mostly from Pakistan. Some were legitimate, but for many it was a cover for illegal entry. The two convicted of conspiring to import heroin were Mohammed Faisal and Roohul Amin, who were involved with running Yorkshire College in Bradford. They and the third man, Ali Ifthikar, were convicted of money laundering. The fourth defendant, Mohammed Alamgir, was found not guilty on both counts by the jury at Bradford Crown Court. The jury had been told that 13 kg of heroin worth £650,000 was seized by customs officers after a series of parcels were sent in the post from Pakistan to addresses controlled by the men. Another 7 kg of heroin was also seized in Pakistan. However much more heroin did reach the men. Analysis of financial accounts at the college and at a Bradford money exchange business ran by two of the men shows that more than £1.2m in profits was sent out of the country to the north west frontier province of Pakistan. The authorities in Britain say the money is now untraceable, and fear that it might be used to prolong the fighting going on in the area between the Pakistani army and the Taliban. Several other people involved in the conspiracy have fled the UK and are believed to be in Pakistan. Away from the court, Detective Inspector Gary Curnow of West Yorkshire Police said officers had managed to disrupt a major drugs smuggling gang. "It's a significant amount from a well organised consortium importing heroin from Pakistan," he said. "These are people who are organised, resilient, and bringing into the country vast amounts of heroin which are then dealt on the streets."